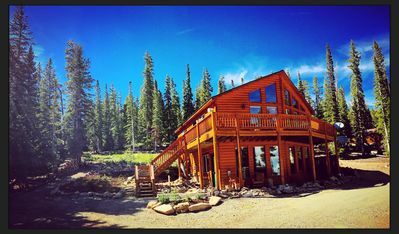 Log Cabin on the Water -- A Place to Experience! 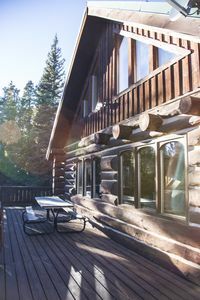 Come and experience PineWater Cabin! 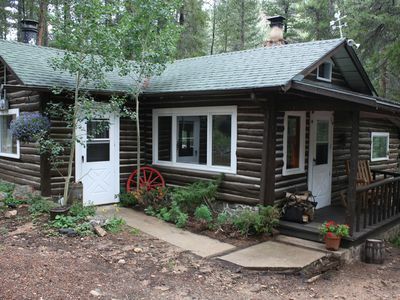 This little vintage log cabin on the creek is the perfect get-away. It was built in the early 1930's and has been added onto over the years all while still maintaining it's idyllic atmosphere and relaxing setting. 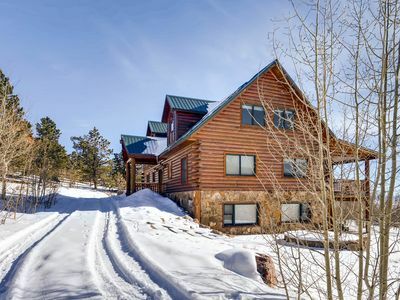 It's less than an hours drive from the Denver metro area in the small mountain town of Bailey. 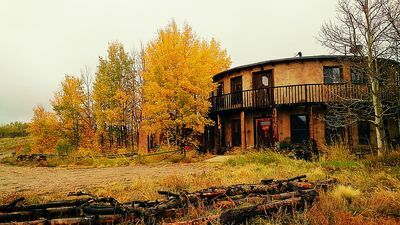 You're a world away from the hectic city in a gorgeous setting with fresh air, nature, towering pine, spruce and aspen trees and a rushing creek that creates an atmosphere you don't often find! One mile from cabin are the miles and miles of hiking trails in the National Forest. 4- wheel drive trails are about 1 mile from cabin. 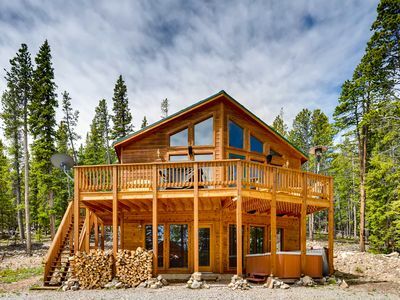 The perfect place for the outdoor enthusiast; this cabin and the lush forest beckon you to connect with nature. 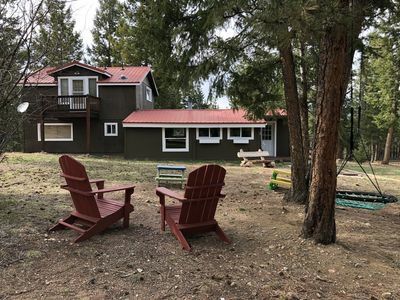 Or for the more artistic type, it offers a setting for writers, painters, etc., who desire peace and quiet with a heavily forested area and a creek that will inspire to no end. Listen to the rushing water in the creek right off your back deck and the sound of birds singing (these are really about the only things you will hear!) and watch for wildlife including big horn sheep, fox, deer and elk, and as of late -- moose (I saw one run through the back yard recently - Awesome! ), or pull out your fishing pole and catch a trout or two! The deck is also great for drinking your morning coffee and eating at the picnic table! 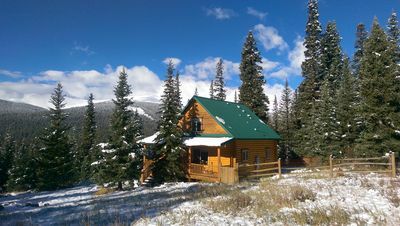 This lovely log cabin was built by the Colorado Civilian Conservation Corps. They built the trails in what is now known as the Mount Evans Wilderness. 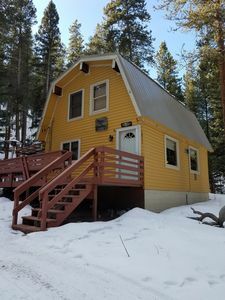 The cabin is off the beaten path on it’s own private road where there are a handful (nearest the cabin) of privately owned cabins; some have full-time residents and a couple have part-time residents. 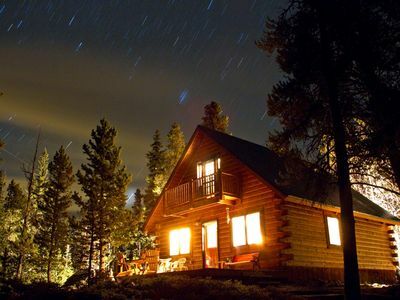 These cabins, for the most part, are not seen directly from cabin with exception of one that is used part-time, so there is still a good sense of privacy. 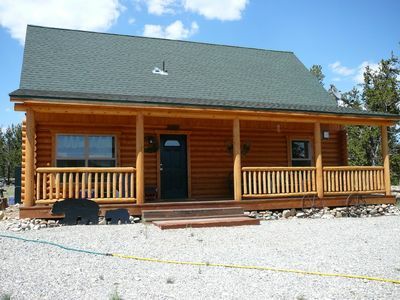 The cabin offers a quaint atmosphere. 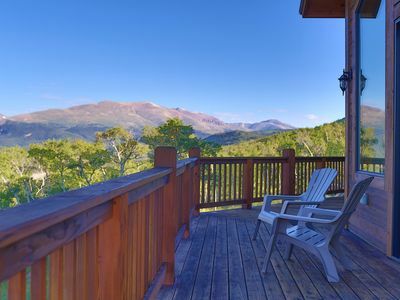 From every window is a beautiful sight of the forest and mountain scenery. 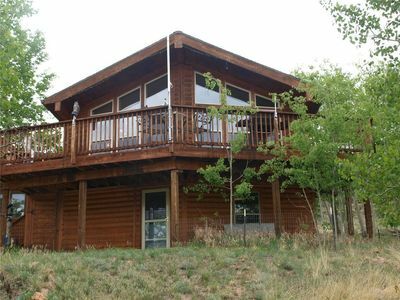 It’s situated on just under an acre and Deer Creek runs through this private, wooded lot providing the soothing sounds of this year round very large creek. The picture windows overlook the creek and in the summer you can open the windows to let in the music of the rushing water. 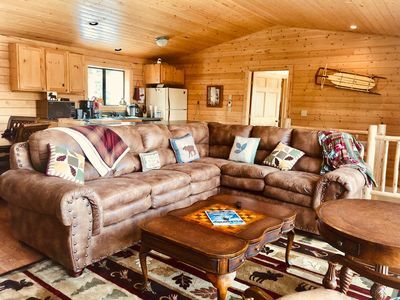 The furnishings make the cabin warm and cozy, such as hickory, oak and pine. It has two bedrooms; one with a queen bed and the other which is a pass-through room has a twin daybed with trundle allowing up to four people to sleep comfortably (five people can sleep if a cot is used or can use couch). The bathroom is newly remodeled and has a whirlpool tub to soak in after a day of hiking. 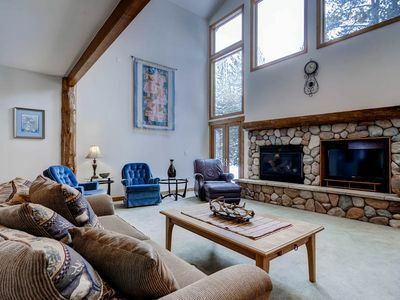 The living room has a wood stove located in the original stone fireplace to provide warmth on those chilly nights or winter days. Electric baseboard heat is also available. The kitchen has the original wood cook stove, but for your convenience a modern day range/oven is also provided along with a fully equipped kitchen (just bring your own food and personal hygiene items!). Rest, relaxation and adventure await you! 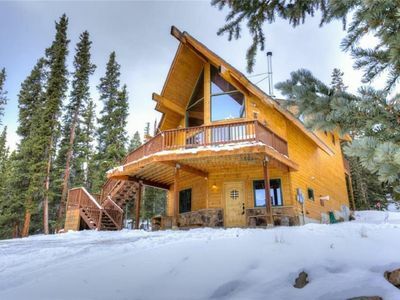 Beautiful, Cozy, Mountain Chalet on 5 acres near Breckenridge with Hot Tub! 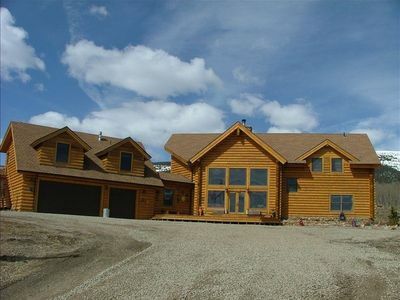 Superb 4BR Fairplay House w/ Great Mountain Views! NEW! 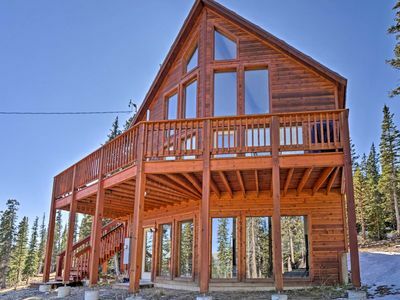 5 Bedroom Home w/ Mountain views at The Starry Sky Lodge near Breckenridge! 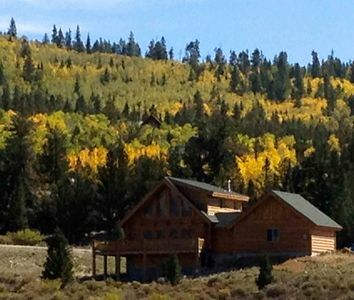 Beautiful Mountain Cabin w/ Privacy and Mountain Views! 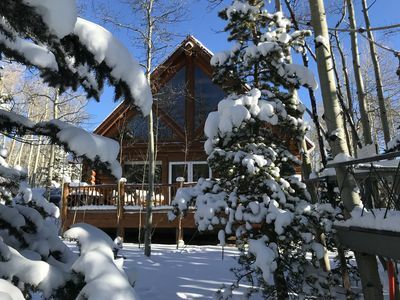 Play, Rest and Relax at the B & B Ranch Mountain Getaway! 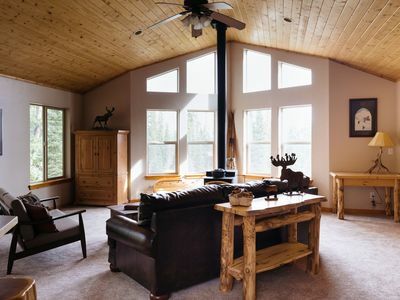 Quiet and Cozy Cabin : "Pines and Needles"